Nine lives might not be enough to survive this catfight! 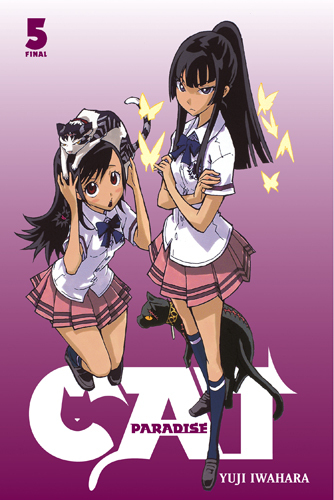 At Matabi Academy, students are allowed to bring their pet cats to the dorms. For Yumi Hayakawa, whose favorite hobby is making clothes for her kitty Kansuke, Matabi seems like a sure bet. After all, nothing can possibly go wrong with her best friend at her side! But on the first day of school, the two find themselves face-to-face with a murderous demonic minion on campus! Will Yumi and Kansuke be able to defend themselves and their school against an ancient cat demon’s thirst for vengeance? Whil looking for her cat, Kansuke, Yumi lands smack-dab in the middle of a mystery! Cats all over Matabi Academy have been disappearing…so Yumi decides to play detective and investigate. Unbeknownst to her and the student council, however, is that the demon cat Kaen’s disciples have infiltrated the school in human guise in an attempt to steal the school founder’s secrets! And when Yumi’s investigation leads her to the heart of those secrets—the old library—she and two student council members find themselves trapped in Rachi the sickle spider’s web…with none of their cat partners anywhere to be found! Will Kansuke, Sakura, and Raimu make it in the nick of time to save their friends? The Matabi Academy student council (and their cats) are on high alert: Spirit Beasts could be possessing students and hiding among the student body, waiting to make a move! Amidst all this tension, Yumi (with Kansuke in tow) decides to unwind at a dorm slumber party with some friends and a good scary story. But when an actual ghostly encounter cuts the party short, Yumi wanders off the school grounds…and right into the maw of another Spirit Beast, Daraku of the Deep! To make matters worse, she’s not the only student council member to take the bait, and with the school practically defenseless, the evil cat demon, Kaen, is about to strike on their home turf!! The fur will fly as the battle frenzy above Matabi Academy ensues! As the skies over Matabi Academy are rent apart and a pathway to the heart of the barrier of Futakago is opened, Kaen and the Spirit Beasts set upon the Princess and Shirayuki to exact their long-anticipated vengeance! While Kamio and Yamamoto fly to the princess’s defense, the Matabi Academy student council pairs left behind prepare for the inevitable battle that lies before (and above) them. And both Yumi and Kansuke have no choice but to face the truth of their mutual past — and their doubts and fears — head-on in order to be effective players in the fight for Akifuji-senpai’s soul, the safety of the campus, and the survival of all mankind! The eleventh hour dawns upon the student council of Matabi Academy! With Kiba’s recounting of what happened in Ftukago a thousand years earlier, the line between enemy and ally begins to blur. The fearsome cat Spirit Beast Kaen is on the verge of achieving his goal to release the other Spirit Beasts…with the help of the Princess of Futakago?! As the truth behind the barrier of Futakago is brought to light and the identity of the true enemy is revealed, Yumi, Kansuke, and their friends will have to fight for their lives, their school, and the fate of the entire world in the thrilling conclusion to Yuji Iwahara’s Cat Paradise!